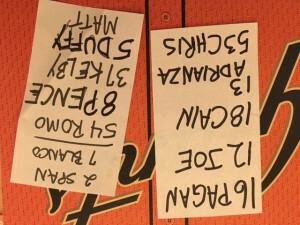 This season, I’ve had a lot in common with Hunter Pence. And Matt Cain, Sergio Romo, and Angel Pagan. Also Kelby Tomlinson, Joe Panik and Matt Duffy. And a bunch of other Giants players. Why? We’ve all been somehow incapacitated and on the DL together. Well, not together together, like being in the same place together. It was more like at the same time kind of together. In case you’re not a baseball person, DL stands for the Disabled List. Players are placed there for various time frames and a number of reasons. Giants players have had everything from hamstring injuries and sore necks to concussions and broken bones. I was on it for foot surgery, which I planned as soon as I saw the 2016 schedule. I picked the time around the All Star Game and break because there were a few long road trips before and after. I wanted to miss the least number of home games possible. That break was a good one for me and the players. With so many guys banged up, the mid-season days off helped with our individual recoveries. When games resumed a few days later, many of the guys were back in action but I was left to watch from my recliner. So I tried to be one with the players as much as I could. My cast was the most obvious way to do this. The technician who put it on is a Giants fan, so of course it had to be orange and black. It became an open canvas for my own affliction and affection for my team. I could have bedazzled it with sequins and other shiny objects, but I couldn’t see myself sweeping loose glitter out of my bed every morning, especially since I had trouble just standing up and balancing on one leg. 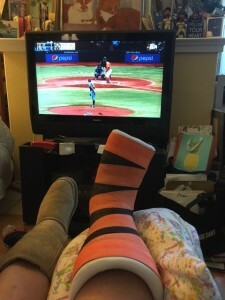 I thought about pasting player pictures on my cast. I considered listing player numbers, but who? Retired numbers? The home grown infield? My favorite players of all time? And in what order? Then it hit me: I could list the players who have been on the DL this season! I printed their names and numbers in block letters on paper so that I could read them upside down while writing on the cast. 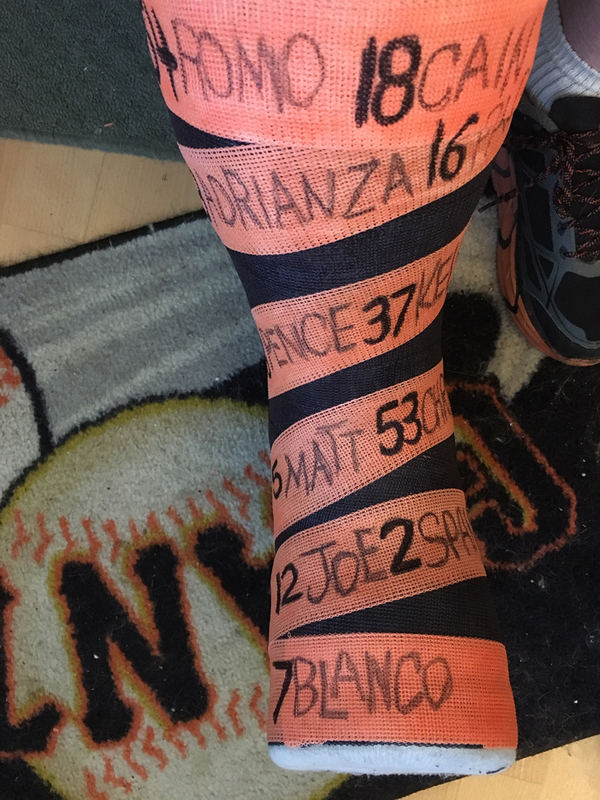 I spent an evening adding the names and numbers, carefully placing them all on the front so none would be sliced in half when my cast was removed. I didn’t want to add to anyone’s trouble with a name-slice. Unfortunately, there were enough players to fill my cast. I even ran out of room. More have been added since I completed my artwork, some have come off the DL, and others are still there or have gone back and forth. It’s been a tough year for injuries, but in spite of that, the Giants are still circling around first place. 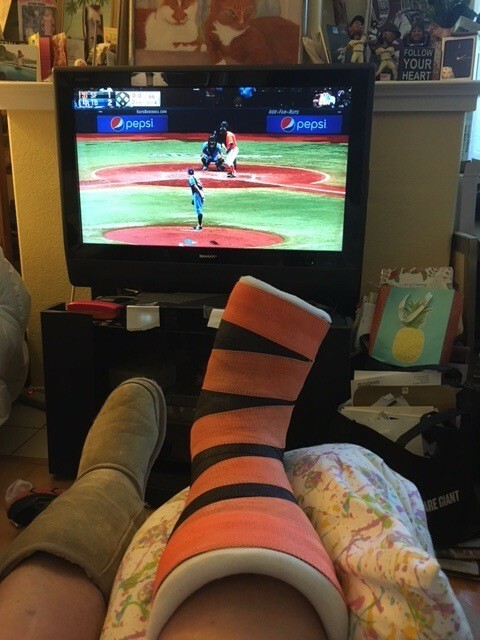 I’m happy to say that I’m now mostly off the DL. I’m driving and have been back to the ballpark to cheer the team on. That means walking very slowly, but justifies a rest stop at the Public House for some food, like onion rings or the breakfast sandwich, two of my favorites. My cast shell now sits in the corner as a memorial to the guys who have been able to heal enough to get back to the game we all love. But it’s time to clean the cast off, remove the names, and get our guys back on the field. We’ve got a pennant to win. I’m glad you are off the DL list! I enjoyed reading your blog post. See you soon at the ball park. Hi Maddy, Thanks a lot! It feels great to be back to both the blog and the park. 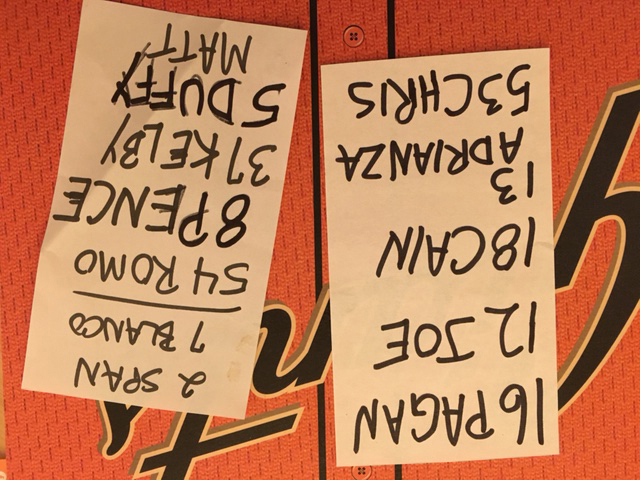 Can’t wait to see everyone at our game!